Prudence is originally from Jacksonville and grew up at the beach where she graduated from Fletcher High School. She attended Stetson University in Deland where she met and married her husband of over 45 years, Bob Baldwin. They have lived the last 30+ years in Jacksonville and have been attending Church of the Redeemer all that time. One of Prudence’s greatest joys is that now her grandchildren, Madeline and Hudson, participate in Redeemer children’s programs. She is the full time Bible teacher at Riverside Presbyterian Day School, a job she enjoys very much. Prudence often jokes that she can’t believe they actually pay her to tell Bible stories all day long to children. 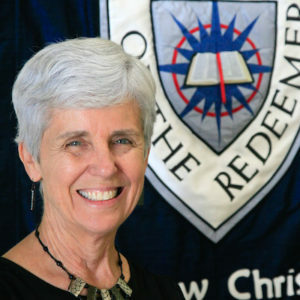 Her job as Children’s Ministry Director at Church of the Redeemer complements that position well. Here, she not only has the joy of ministering to the children and their parents, she can watch the students grow through youth ministry, go off to colleges and return as Christ-centered young adults. What a blessing! Prudence can be reached at rfbald@bellsouth.net or pbaldwin@rpds.com and 708-1221.